The side quests. A great idea from Blizzard, not be bored to let the individual games and to bring a little more action pure. On the 6 different cards there are 6 different side quests which your team can bring major benefits during the game. Of course, even with the side quests the competition effect is included. Which team Tactical preparing for the side quests and good plays together has a great advantage in reaching the side quests. I tell you now, which keeps what side Map task in store for you. On this map are each 2 Temple, once on the top of the map and on the lower side. This must be taken. Kill the mobs that appear there if you have taken the temple, this fires a par seconds flashes on the towers of the opponents. These side task can determine much about the gameplay, because the towers are to be very pissed if these flashes have it apart even on a team. Here dark flowers always appear at night, kill and collect the seeds from them. Has the entire team collected 100 seeds a player from the team can be transformed into a plant-monster that has a lot of HP and can do great damage to towers. This side task is rather unreliable. Especially if a player turns into this monster, which makes it for the first time or has problems with his internet, this can be a weak point of the secondary task. In the ghost mines must periodically in the mine below mobs are killed. When the time is up, each team receives a Golem. The more mobs killed each team the stronger the respective Golem. The Golem is fighting together with your team against your opponent for a certain period, or until he dies. The secondary task has two teams. Even if a team gets a weaker golem than the other team, he is nevertheless a help for the team. In Cursed Valley Tribute repeatedly appear on the map. These must right-click and a slightly longer cast time to collect. Once a team has collected 3 tributes, the opposing team is cursed. This means that the vassals have all an HP and your buildings get more damage. Grade for "pushing" a good side quest. If the team fulfills this has a great advantage because they are much faster. However, if you still do not give up and keep your opponents stood, these secondary task is not much help. Because your heroes are not affected by this curse! In the dragon gardens there are 2 shrines. If a team has taken both shrines receives this team a Dragon Knight, which inflicts massive damage and your Heroes can throw on the Map. The Dragon Knight is a strong ally or enemy. Upon occasion in which position you find yourself. However, if you introduce yourself to 5 against the dragon he will fall quickly! However, he really can throw you on the map, it may throw you a couple of feet away using a spell. If you have bad luck, you fly behind a barrier and must first run around them again. 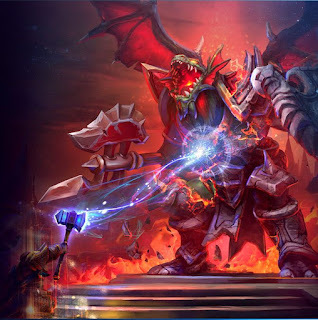 The Preference provides the Dragon Knight course for some time, which he invested in destroying your towers. Here each team must collect doubloons. If a team has collected enough doubloons and the pirates paid so bombarded this with his pirate ship the opposing team. When these bullets hit an enemy or a tower, they do a lot of damage. However, some balls do not hit, but this is normal.